During the Civil War the town was garrisoned for the Parliamentarians and in 1642 was unsuccessfully attacked by Royalist forces from Leeds. Sir Thomas Fairfax took the command of the garrison and marched to meet the Duke of Newcastle but was defeated. The Parliamentarians retreated to Bradford and the Royalists set up headquarters at Bolling Hall from where the town was besieged leading to its surrender. The Civil War caused a decline in industry but after the accession of William III and Mary II in 1689 prosperity began to return. The launch of manufacturing in the early 18th century marked the start of the town's development while new canal and turnpike road links encouraged trade. Like many major cities Bradford has been a destination for immigrants. In the 1840s Bradford's population was significantly increased by migrants from Ireland, particularly rural Mayo and Sligo, and by 1851 about 10% of the population were born in Ireland, the largest proportion in Yorkshire. Around the middle decades of the 19th century the Irish were concentrated in eight densely settled areas situated near the town centre. One of these was the Bedford Street area of Broomfields which in 1861 contained 1,162 persons of Irish birth—19% of all Irish born persons in the Borough. During the 1820s and 1830s, there was immigration from Germany. Many were Jewish merchants and they became active in the life of the town. The Jewish community mostly living in the Manningham area of the town, numbered about 100 families but was influential in the development of Bradford as a major exporter of woollen goods from their textile export houses predominately based in Little Germany and the civic life of Bradford. Charles Semon (1814–1877) was a textile merchant and philanthropist who developed a productive textile export house in the town, he became the first foreign and Jewish mayor of Bradford in 1864. Jacob Behrens (1806–1889) was the first foreign textile merchant to export woollen goods from the town, his company developed into an international multimillion-pound business. Behrens was a philanthropist, he also helped to establish the Bradford chamber of commerce in 1851. Jacob Moser (1839 – 1922) was a textile merchant who was a partner in the firm Edelstein, Moser and Co, which developed into a successful Bradford textile export house. Moser was a philanthropist, he founded the Bradford Charity Organisation Society and the City Guild of Help. In 1910 Moser became the first Jewish Lord Mayor of Bradford. On the morning of 1 July 1916, an estimated 1,394 young men from Bradford and District The Bradford Pals, the 16th and 18th Battalions of The Prince of Wales's Own West Yorkshire Regiment left their trenches in Northern France to advance across No Man's Land. It was the first hour of the first day of the Battle of the Somme. Of the estimated 1,394 men who left the trenches, 1,060 were either killed or injured during the ill-fated attack on the village of Serre. The Yorkshire Building Society opened its new headquarters in the city in 1992. In 2006 Wm Morrison Supermarkets opened its new headquarters in the city, the firm employs more than 5,000 people in Bradford. In June 2009 Bradford became the worlds first UNESCO City of Film, the city has a long history of producing both films and the technology that produces moving film which includes the invention of the Cieroscope, which took place in Manningham in 1896. In 2010 Provident Financial opened its new headquarters in the city. The company has been based in the city since 1880. In 2012 the British Wool Marketing Board opened its new headquarters in the city. 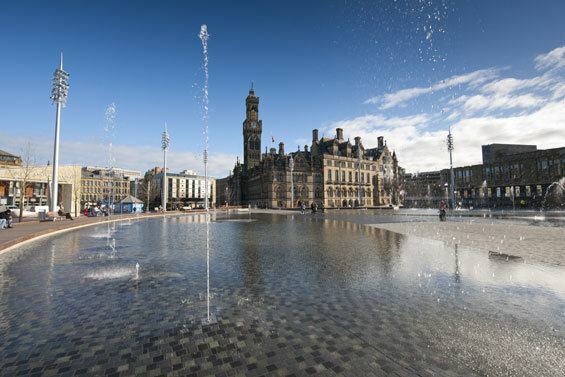 Also in 2012 Bradford City Park opened, the park which cost £24.5 million to construct is a public space in the city centre which features numerous fountains and a mirror pool surrounded by benches and a walk way. In 2015 The Broadway opened, the shopping and leisure complex in the centre of Bradford cost £260 million to build and is owned by Meyer Bergman. Bradford is located at 53°45′00″N 01°50′00″W (53.7500, -1.8333)1. Topographically, it is located in the eastern moorland region of the South Pennines. 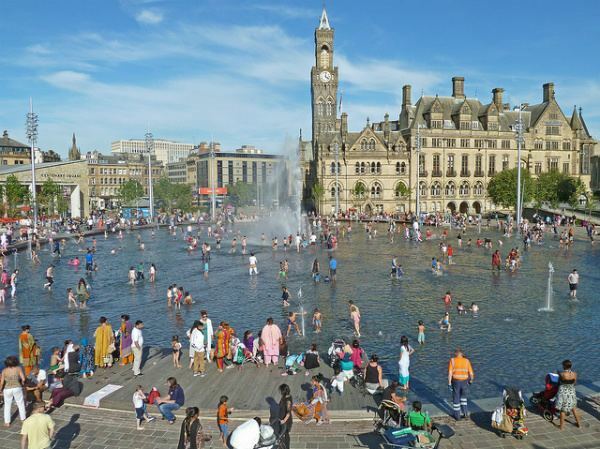 As with the rest of the UK, Bradford experiences a maritime climate, with limited seasonal temperature ranges, and generally moderate rainfall throughout the year. Records have been collected since 1908 from the Met Office's weather station at Lister Park, a short distance north of the city centre. This constitutes one of the nation's longest unbroken records of daily data. The full record can be found on the council's website. The long-term health study Born in Bradford studied births in the city between 2007-2011 and found that the rate of birth defects was 3%, nearly twice the national average of 1.7%. The leading cause was found to be a 37% rate of consanguineous marriage among British Pakistanis, which had become more common than a generation earlier. A contributing cause was babies born to mothers over 34 years of age. Bradford's textile industry has been in decline for many years and the city has suffered from de-industrialisation. Some areas of Bradford are among the worst levels of social deprivation in the UK, with widespread pockets of exclusion, and rates of unemployment in some wards exceeding 25%, though other areas of Bradford are among the least deprived in the UK. The economy is worth around £9.5 billion, making Bradford's economy a major powerhouse in the region and is forecast to grow to more than £10 billion by 2018, contributing around 8.4% of the region's output, and making the district the third largest (after Leeds and Sheffield) in Yorkshire & Humber. The economy has diversified and the city is home to several major companies, notably in finance (Yorkshire Building Society, Provident Financial, Santander UK), textiles ( British Wool Marketing Board, Bulmer and Lumb Group), chemicals (BASF, Nufarm UK), electronics (Pace Micro, Filtronic), engineering (NG Bailey, Powell Switchgear), and manufacturing, (Denso Marston, Bailey Offsite, Hallmark Cards UK and Seabrook Potato Crisps). Supermarket chain Morrisons has its head office in Bradford as does water utility company Yorkshire Water. One of the city's biggest employers is Provident Financial plc, a financial services group that specialises in Home Collected Credit (HCC) and owns Vanquis Bank which offers credit cards. It is listed on the London Stock Exchange and is a constituent of the FTSE 100 Index. The company was established in 1880 by Joshua Kelley Waddilove to provide affordable credit to families in West Yorkshire. It has moved into a 250,000 sq ft (23,000 m2), £45 million, flagship headquarters building in the city centre creating hundreds of jobs for the city. The building also houses a 200-bed Jurys Inn hotel. The Kirkgate Shopping Centre is a shopping mall in Bradford city centre. It includes Primark, New Look, Bank, W H Smith, Boots, SportsDirect.com, Deichmann and F. Hinds in its 65 shops, as well as an indoor market and 550 car parking spaces. The centre has undergone a multimillion-pound refurbishment recently, and plans to upgrade the facade of the 1960s building have been submitted as it anticipates competition from the long-awaited £260 million Westfield development which opened on 5 November 2015. Sunbridge Wells is an underground retail complex, it incorporates restaurants, bars and retail units. The complex is built in a series of Victorian tunnels situated in the centre of Bradford. Bradford's main art gallery is housed in the grand Edwardian Cartwright Hall in Lister Park. The National Science and Media Museum celebrates cinema and movies, and is the most visited museum outside London. It contains an Imax cinema, the Cubby Broccoli Cinema, and the Pictureville Cinema — described by David Puttnam as the best cinema in Britain. The National Science and Media Museum hosts the Bradford International Film Festival annually in March. 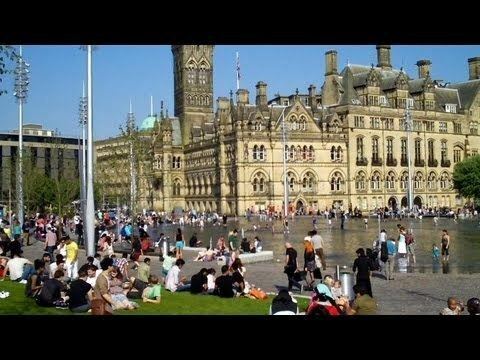 In June 2009 Bradford was designated the world's first UNESCO City of Film for its links to the production and distribution of films, its media and film museum and its "cinematographic legacy". Nightlife in Bradford has traditionally centred on Manor Row and Manningham Lane. More recently, several clubs and pubs have opened in the West End of Bradford, around the Alhambra Theatre, turning what was a previously fairly quiet area into one that is often crowded and vibrant at night. North Parade has also seen several new themed bars open and is at the heart of the Independent Quarter of the city. Sunbridge Wells is an underground leisure and retail complex which opened in Bradford city centre in 2016. 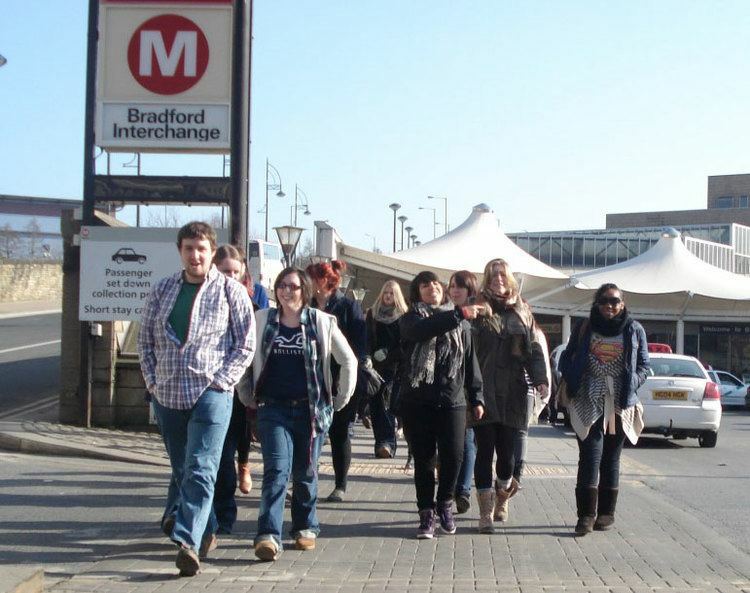 Bradford is home to the acclaimed National Science and Media Museum (previously the National Museum of Photography, Film & Television) which celebrates cinema and movies, and is the most visited museum outside London. It contains the UK's first IMAX theatre, the Cubby Broccoli Cinema, and the Pictureville Cinema — described by David Puttnam as the best cinema in Britain. The Bradford Dragons are the city's basketball team, competing in the second tier English Basketball League Division 1. The team are coached by Chris Mellor and play their home games at Bradford College. The team are having a strong season, and are on courseto reach the post season playoffs.